Manchester’s techno pioneers were formed in 1988 when Martin Price, owner of the city’s seminal Eastern Bloc underground record store, teamed up with Graham Massey, formerly of Factory Records’ Biting Tongues and more recently renowned as a producer. The debut EP, Newbuild was cut in collaboration with fellow Mancunian Gerald Simpson. The trio were also responsible for mixing tracks for local artists, including Inspiral Carpets. In 1989 Simpson departed to launch his own vehicle, A Guy Called Gerald, and DJ duo the Spinmasters (Andrew Barker and Darren Partington) were drafted into 808 State. The new quartet cut the Quadrastate EP, a huge club hit, and the single Pacific which crossed over into the national top ten at the tail end of 1989. The timing of their rise to prominence worked in their favour, as the Madchester explosion began dominating the UK music and style press. 808 State were cast alongside the likes of the Stone Roses and Happy Mondays which aroused interest from the rock world and broke down barriers between the indie and dance factions. 808 State signed to ZTT in 1990 and delivered the classic 808:90, which was immediately adopted by the rave generation as a soundtrack to post-gig chill out sessions, as well as becoming a favourite with DJs and rock concert audiences. Additionally, a single, The Only Rhyme That Bites, cut with rapper MC Tunes cruised into the UK top ten in June. Ex:El followed in 1991, and included collaborations with Björk, (then of Sugarcubes) and New Order vocalist Bernard Sumner. In October of that year a US tour was arranged, but Price decided against making the trip, preferring to stay in Manchester to encourage and manage local talent, (including Rochdale rappers The Kaliphz) and developing his own musical ideas. 808 State pressed on, recording Gorgeous, which featured Echo and the Bunnymen singer Ian McCulloch and samples from some inspired sources such as The Jam, UB40 and sound bites from Star Wars. The band also delivered a string of groundbreaking remixes for other artists including David Bowie, Soundgarden and Primal Scream. 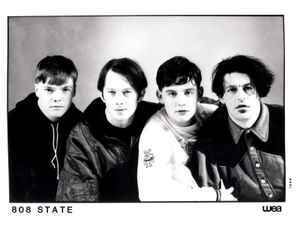 In 1996, 808 State re-emerged with a new album, the radically experimental Don Solaris, which won the band acclaim from both long-term fans and recent converts. The record’s currency was informed by acid-house and trip-hop, occasionally veering into the in-vogue sounds of jungle and garage, the music du jour of UK clubland. Once more guest vocalists were employed to add colour to the familiar layered sonic textures - James Dean Bradfield (Manic Street Preachers) and Lamb’s Louise Rhodes amongst them – and paved the way for a triumphant homecoming concert to close the commonwealth games, in front of 40,000 people. They also hosted radio shows on Sunset FM & Kiss FM (Manchester). I'll never forget the way "Gorgeous" changed my life back in 1993. The tune's moods, the different perspectives, all of them sounded like the main ingredients for a timeless album. "Southern Cross" was the one that impressed the most, for its futuristic & intimate climax. 808's futuristic breakbeats journey is legacy - and the signs of it could be seen on "Ninety"'s tunes such as the beautiful mellow "Magical Dream", as well as "Cobra Bora". Just a while later, "Cubik" was a statement that there was a kind of a close connection with the Techno World as well - from "Sunrise" to "Southern Cross", among others - an evidence that 808 State's tunes brought an incredible combination of Techno and Breakbeats elements. "Pacific" was the highlight on the specialist's opininon, for it elevated the electronic dance music scene a step further, merging it in a combination of elegance and avant-garde - (special credits must also be given to Gerald Simpson for that). People have been hearing 808 State's sounds for years, which reminds us about that quote about compositions that stand the test of time: "Timeless" is about creating ART in such a way that can be heard in the past, present and future - instead of the discardable 'productions' that occupies most of the store's shelfs nowadays. 808 State are true electronic pioneers that opened up the possibilities for so many forthcoming British electronic artists. If you think about their groundbreaking Newbuild album that came out in 1988 and has only recently been recognised as a classic ahead of it's time, this was long before the fantastic Warp label had taken off with it's roster of great artist albums. Aside from their fantastic club classics such as 'Pacific' & 'Cubik', awesome groundbreaking pieces of electronic house music, it's their albums which proved that electronic music could produce brilliant long players and not just one off hit wonders. From Newbuild to Don Solaris and all the more recent music like Invader; my favorite 808 State has to be whichever one I'm listening to at the moment. Someone needs to make the point that it is hard to overcome the success of the early 808 State material like Cubik and Pacific, and while those are by far their most successful songs, this groups music just keeps getting better with every release. This is some of the best electronic muisc ever made. driving up Highway 1 through the central coast of California, I played it in it's entirety and it all made sense. Dunno a thing about Outpost Transmission....yet..